The PC of the 90s was hired first by companies as a productivity boosting tool and second by consumers as a way to duplicate their work productivity and communications in their personal lives. However something changed with PCs when the laptop became “good enough”. With portable computing, the job the PC was hired to do evolved. It was more important that the product be well designed (for aesthetic value, usability and reliability) than just fast and spacious. The microprocessors were plenty fast but what mattered more was low power consumption, a low profile and tighter integration with software. The product was also purchased in a different way. A desktop could be purchased on specs alone, sight unseen, from a catalog. But a laptop had to be touched, hefted and the screen had to be observed and the whole design contemplated before a purchase decision was made. The product had an integrated keyboard, display, touchpad and storage. It was not easily serviced by end users. It was, in a word, re-integrated. You can see how portability changed the job and therefore everything else as well. Consumer tastes became important, retail distribution became necessary and R&D resources had to be applied to solve what was no longer good enough: the whole package. Vendors which did not prioritize design, retail and R&D were left flat-footed. At the same time, systems software became more commoditized and productivity software became portable. The old measures of performance were being over-shot while the new measures of performance were under-served. While this shift was underway on the hardware side, Microsoft continued to improve their product to serve more demanding business productivity jobs. Their software was not getting optimized for this new portable consumer job. They left the new market open to disruption. In stepped the MacBook with good enough (and improving) office productivity. With excellent appeal along the dimensions of performance consumers demand most of all. It was priced higher than other laptops but the price points were affordable and, inflation-adjusted, lower than they’d ever been. It should not be a surprise that Apple was one of the first vendors to see its portables line become bigger than its desktop lines. The market evolved to the point where what Apple had was what the buyers needed. 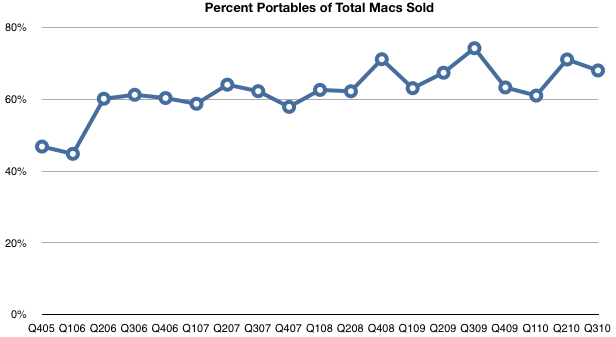 The shift to portability is a compelling story for Apple as disruptor in the PC market. It may not result in a complete reversal of the PC hegemony but it allows Apple to grow a product line at triple the growth rate of the market. A market that was considered completely dominated by entrenched incumbents with an unbreakable profit formula. But with the iPad Apple is clearly also aiming at disrupting the Mac (and, transitively, the PC as a whole.) The iPad can be seen as an evolution toward seamless portability; the mobile computing paradigm shift. ‹ Previous Post Are mobile networks commodities? › Next Post Did Google Arm Its Own Enemies With Android?